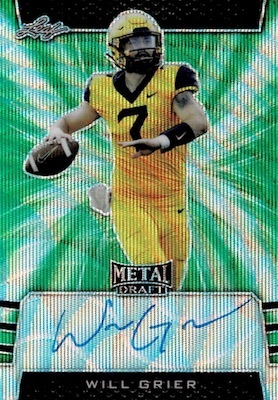 One of the more popular pre-draft options from Leaf, 2019 Leaf Metal Draft Football offers chromium designs, on-card autographs and multiple parallel tiers. Although the hard-signed release is the same as 2018 with five on-card autographs per Hobby box, there is a new Jumbo format that contains nine on-card autographs and one production proof autograph. Those who have collected prior iterations should know what to expect from the 2019 Leaf Metal Draft Football checklist. That means hard-signed autographs and only a few main designs. Extra focus is placed on skill-position players and top defensive stars heading into the 2019 NFL Draft. The color-filled release also promises a variety of Prismatic and Wave parallels. In addition to the base autograph designs, there are themed Tenacious "D" and State Pride insert autographs. Exclusive to Jumbo boxes, the one-of-one Production Proof Clear autographs are each slabbed. These come one per Jumbo box. 2018 Leaf Metal Draft Touchdown Kings COURTLAND SUTTON RC AUTO 10 10 SSP! SICK! 2019 Leaf Metal Draft - Drew Lock State Pride Auto 1 15 - EBAY 1 1!!!! Buy 2019 Leaf Metal Draft Football autographs on eBay. PARALLEL CARDS: Blue #/35, Purple #/25, Pink #/20, Black #/15, Green #/10, Orange #/7, Red #/5, Gold 1/1, Gold Super 1/1. WAVE PARALLELS: Silver, Blue #/20, Purple #/15, Pink #/10, Black #/7, Green #/5, Orange #/3, Red #/2, Gold 1/1. View the 2019 Leaf Metal Draft Football checklist Excel spreadsheet. Nice to see a product that hasn’t gotten carried away with over-production. I think Panini could learn something from Leaf. Granted each year there are still more parallels but nothing to the degree of Panini products. This is how you do a draft pick product, with draft picks. Not 10% draft picks with the same old, same old checklist of pros in their college jerseys recycled every year. Collector who has plenty cards of Aaron Rodgers in his Cal jersey, thank you very much.